Just a reminder, this Wednesday is the launch of our new exhibition! WHERE: Melbourne City Library – Flinders Lane right near Degraves st.
OPEN: December 2nd – January 9th 2017.
WHO: Animatronic sculptural artist James Cattell, photographic artist Aglaia Bolis, and myself, Anthropomorphic taxidermy artist, Lucia Mocnay. There will be a few surprises on the night. We really hope you can make it along! You are all invited to my new show,”Mythologia“. I have teamed up with local artist James Cattell who creates wonderfully intrinsic robotic interactive sculptures, and my bestie Aglaia B, who I’ve collaborated with in the past on many photographic adventures. Together we’ll be showcasing our recent work in the realm of Mythologies- personal, historical and worldly. It’s running over the Christmas holiday season so there will be elements of Yule tied in as well; I’m doing a rendition of Rudolph the Red Nosed Reindeer, and of course, the dark counterpart of Christmas, Krampus, will also be there. Running from 2nd December 2016 to January 9th 2017. Opening on Wednesday 7th December, 6 – 9pm. Most of the exhibition will be upstairs at the gallery, though we’ll have a few pieces scattered in displays around the entire building so keep your eyes peeled. Items will be for sale, though, the majority of my work has already been sold, therefore this is the last time they will all be displayed together before being sent off overseas and scattered around the globe. A last hurrah if you wish! I do hope you can make it along to see it, and even better come say hello on Opening night! Thanks sooo much for the support over the years as well, you guys rule and it means a lot to me. This Saturday is the Opening of the beinArt galleries Small Works Group Show. Click the image above for more details. Made of foraged rabbit bones, antique Victorian era textiles and embellishments sourced from the Schaumburg-Lippe’s Royal family of Germany. There is a sodalite cabachon in there aswell. Based on the Decorated Saint Skeletons of Ancient Catholic History, as found in Paul Koudounaris’ “Heavenly Bodies” book. Talented Nuns would decorate Saints bones’ after their death in order to activate the Saints powers for all of humanity. The Demiurge is known as the ultimate architect and master craftsman of the universe, the word being used to describe all artisians in the olden days. When the Catholic Nuns were given bones which they couldn’t identify, they would give the bones a name based on their essence, as I have done here, for rabbits are masters at (pro)Creation. So this work is dedicated to aiding all the artists and master craftsmen, for all they create. Presales for the show are on at the moment, contact beinArt gallery . Cost of St Demiurge is $500 and the piece can be sent world wide. 13 x 13 x 10 cms. Glass dome not pictured. If you are in Melbourne come down this Saturday night 6-9pm for the opening! The time has come to invite you all to my big show! I am over the moon with excitement to be showing the largest collection of my work to date, alongside two American artists, at the new beinArt Gallery. I would love for you to come and meet my curious characters. Opening reception – 6pm – 9pm Saturday May 28th. All works will be for sale. Please put the date in your diaries, I’d be delighted to see you there. I am flying overseas the very next day so it will be a great chance to say aloha & adieu. This year has already brought much exciting news on my art front. beinArt, a long time supporter of surreal artists worldwide, is opening a gallery space in my home town of Melbourne. I am super pleased to be on board! Their inaugural show is coming up in March with a ton of fantastic artists, and watch this space for news of a 2 person show later in the year. You are invited to come along to their Official Opening. Come and celebrate the grand opening of beinArt Gallery on March 12th at our inaugural group exhibition. We will be showcasing over 50 works from a host of leading local and international artists! This will be a truly spectacular show celebrating a growing international movement of highly skilled figurative artists with inclinations towards the strange and anomalous. WHEN: Opens Saturday, March 12th with an opening reception, 7pm – 10pm and runs until April 28th. PARTICIPATING ARTISTS: Julia deVille, Jana Brike, Scott Musgrove, Chet Zar, Casey Weldon, Kit King, Oda, Alex Garant, James Guppy, Peter Gric, Scott G Brooks, Chris Leib, Amanda Sage, Lucy Hardie, Rachel Bess, Ben Howe, Carrie Ann Baade, Sandra Yagi, Lucia Mocnay, Joshua Suda, Maria Teicher, Effie Pryer, Tim Molloy, Beau White, Iain Whittaker, Kim Evans, Ville Lopponen, Marina Dieul, Isabel Peppard, Dale Keogh, Jeff Christensen, Orryelle Defenestrate Bascule, Larkin, Macsorro & more! beinArt Gallery will also stock a range of limited-edition prints from respected artists such as Greg “Craola” Simkins, John Brosio, Redd Walitzki, Cam de Leon & Matt Dangler. We also carry a curated range of speciality books, artisanal jewellery and other curiosities. Free world-wide shipping for all purchases over $1,000 AUD. 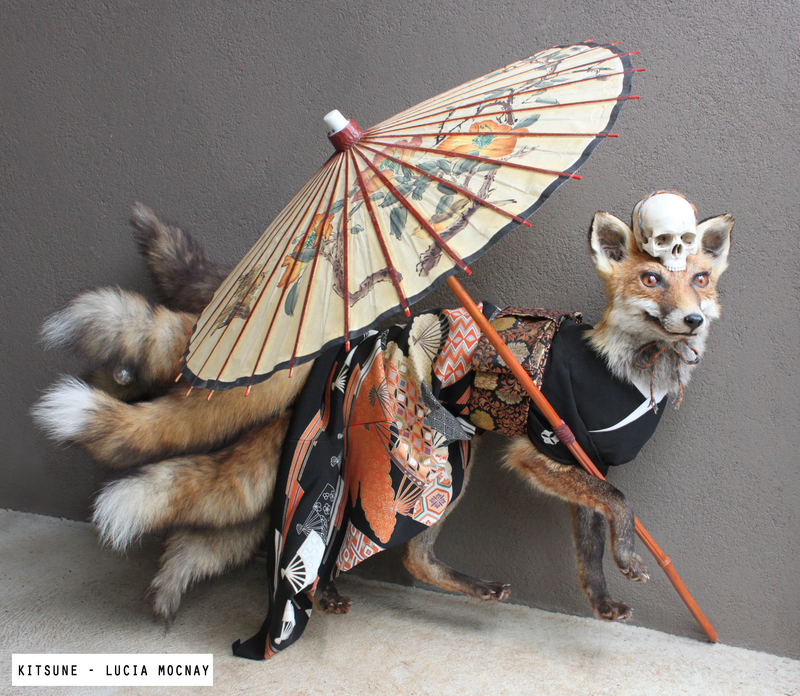 As part of my second series of full bodied taxidermy pieces, I made this 9 tailed Kitsune fox early this year. Kitsune’s are mythological creatures from Japanese folklore, fox spirits with multiple tails who can shape-shift into other creatures, including humans. The stories are varied as to whether they are deceptive or helpful, depending on how you treat them. The more tails they have, the older and wiser they are, 9 being the upper limit. They shape-shift by tying a skull onto their heads – the skull of whatever creature they want to shape-shift into. They possess a small white ball called hoshi no tama, which holds their magical power, and if a human manages to attain a kitsune’s hoshi no tama, they can control them. Many kitsunes shape-shift into geishas by day and seduce and marry men. Then at night they sneak out to be foxy in the wild. Ladies who have foxy/feline features are rumoured to be Kitsunes, and superstitious folk look for tails peeking out from underneath their kimonos. The particular fable I based this piece on, is one where a young man happens upon a hurt fox in the woods, who is trapped by a fallen tree. As he is kind, he lifts the tree and saves the fox, and in order to repay him, she shape-shifts into a beautiful geisha, and devises a plan. “Take me to the nearest town to their most exquisite brothel. Sell me to the owner for no less than 3000 pennies.” This seemed like much too much money, and the young man thought it would never work, though obligingly he did as the Kitsune asked. When there, she uses her magic and beauty to charm the brothel owner and he happily pays a mint for her, thinking his new geisha would be his prized possession and would bring him much business once word got around of her presence. After the deal was done, the young man, amazed at his new fortune though reluctant to leave her there, goes back to the woods to continue his journey. That night the Kitsune shape-shifts back into fox form and escapes the brothel to find the young man in the woods, where she turns back into geisha form, and they marry and make a house deep in the woods and live happily ever after with their new found fortune. It was tons of fun researching and making this piece. I have an affinity with Japan and it just made me want to go back there and explore the countryside some more. My Kitsune’s clothing is sourced from Japan from recycled kimonos and a vintage obi – (kimono belt). The hoshi no tama (spirit ball) is from a museum collection from Hervey Bay, Australia, it’s an antique Japanese Ojime bead made from mother of pearl, used on the Inro – in other words, a special bead that closes a little pouch that served as a pocket, tied to the kimono’s obi belt as kimono’s don’t have pockets. A very important accessory worn in the olden days, holding ones money and treasures and medicines. It was such a great find, it seems like that one piece was meant to be for this Kitsune, and it somehow ended up here in Australia for me to find. You can see it dangling from one of Kitsune’s tails, as that’s where they hide them. Hoshi no tama. Antique Japanese Ojime bead made of Mother of Pearl. Hope you enjoyed the read and the mini history/folk tale lesson! I’ll be posting more photos of Kitsune in the near future, on my social media sites. Happy Greek Easter and Khmer New Year! The newest bit of news on my workfront is an interview with me in #Taximag issue #3. Click the image above to read it. who you may have seen creeping around the internets. Print versions available soon on Ebay.